The third round of Every Day Counts features 11 technologies and practices that can shorten the project delivery process, enhance durability and safety, and improve environmental sustainability. The focus is on providing efficiency through technology and collaboration. Using 3D engineered models enables the highway community to effectively connect a project’s design and construction phases. 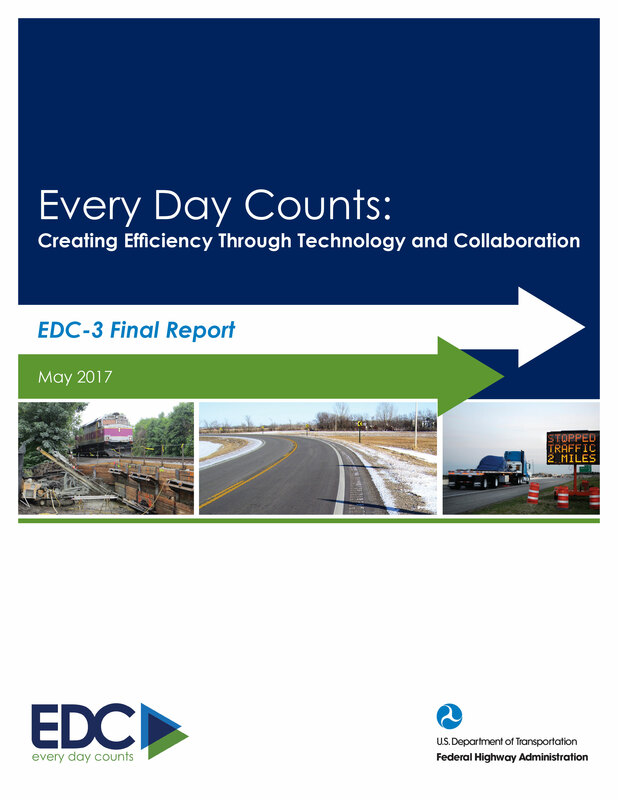 EDC-3 promotes the expansion of 3D applications to manage roadway inventory and assets, improve schedule and cost management, and create accurate as-built records. Data-driven safety analysis promotes the integration of safety performance into highway investment decisions with the goal of saving lives. EDC-3 focuses on two safety analysis approaches: predictive to estimate an existing or proposed road’s safety performance and systemic to screen a road network for high-risk features and identify safety treatments. An electronic project document management system, e-Construction replaces paper with common technology tools to improve workflow and save time and money. e-Construction is also an American Association of State Highway and Transportation Officials Innovation Initiative focus technology. This EDC-3 effort supports tools to foster collaborative, concurrent and transparent interagency reviews that save time and money on and improve the quality of National Environmental Policy Act documents for highway projects. It includes strategies to implement quality environmental documentation and eNEPA, an online workflow tool for projects that require NEPA documents. This EDC-3 strategy encourages transportation departments and railroads to work together to identify issues and negotiate agreements to expedite development of highway projects involving railroad rights-of-way. It uses a model agreement library, tools and training developed under the second Strategic Highway Research Program R16 project. Stakeholder partnering brings local, state and federal agencies together to increase program compliance and streamline the project delivery process under the Federal-Aid Highway Program. Stakeholder partnering groups identify program-level issues, review project development processes and work on solutions through a defined decision-making process and action plans. Regional models of cooperation help highway agencies, regional groups and other stakeholders coordinate transportation planning across jurisdictions to cut project delivery times and traffic congestion. EDC-3 promotes a framework and process for developing multijurisdictional agreements that improve collaboration, policy implementation and performance management. A road diet is a low-cost strategy that reconfigures a roadway cross-section to safely accommodate all users, increase mobility and access, reduce crashes and improve a community’s quality of life. Roadway reconfiguration is a safety-focused alternative for mixed-use streets. EDC-3 encourages the adoption of two efficient work zone strategies to minimize travel delays and enhance safety. Project coordination involves construction planning that minimizes the impact of work zones and generates time and cost savings. Technology applications use intelligent transportation systems to manage work zone traffic dynamically. Ultra-high performance concrete is a steel fiber-reinforced material that improves durability and simplifies connection details, fabrication and construction when using prefabricated bridge elements. UHPC can help the transportation community increase the routine use of prefabricated bridge elements to accelerate bridge construction.